Each year Dave and Vicki Rhyne put on their aprons and hats and begin the process of baking their moist and delicious pecan fruitcake. Theirs is truly a home bakery where the mixing and baking is done by them with help from a couple of long time employees. 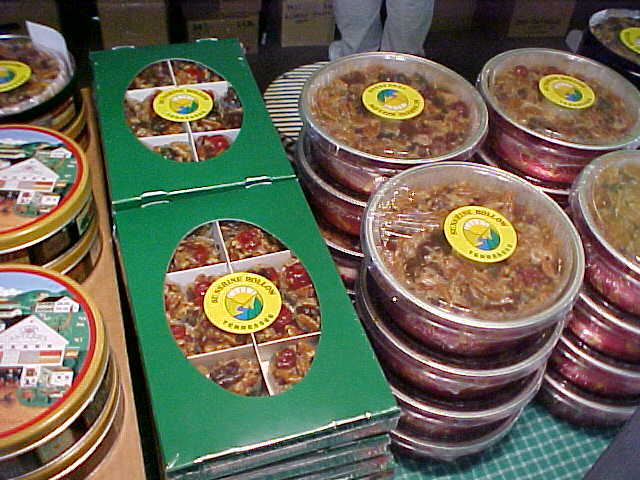 Only a limited number of pecan fruitcakes are baked each year. Since the first cakes were baked in 1968 for friends and relatives (And still are!) they wanted to ensure that they produced only the best. The story began in 1968 while Dave was in the Army. He wanted to do something different for Christmas that year so he decided to make his own presents. Being someone who used cookbooks to learn how to cook as a bachelor, the first cakes were baked using a composite of many recipes he collected. Many changes were made over the next decade or so. When he met Vicki in 1982 she began to help with the cake baking. Vicki also loved cooking and together they tweaked the recipe to get the perfect combination of ingredients in order to make the moistest and most flavorful pecan fruitcake possible. This "secret recipe" has been used now for more than two decades. We hope you will enjoy this short tour of the baking process and will understand better the quality and care that go into a Sunshine Hollow Pecan Fruitcake. Dozens of thumbnails linking to photos are included in the tour! Follow the baking process at Sunshine Hollow Bakery in this virtual tour. Meet the owners, see the bakery, see the ingredients, watch as cake batter is mixed, see cakes just out of the baking oven, see how cakes are packaged and labeled, view the shipping process, and learn about various sales outlets. We hope that you enjoy this brief illustrative tour. Version: i, February, 2007. Page generated 10:23 EDT; Saturday, April 20, 2019.